Choosing to wait for a sponsor may have backfired for Bryn Kenney. Kenney lost a big pot against Pascal LeFrancois, bluffing his way into a runner-runner two pair, only to learn that LeFrancois had flopped a set. Kenney was crippled to a handful of big blinds, and moved all in on the next hand with pocket deuces (2-2). Unfortunately, LeFrancois had pocket aces (A-A), and that was the end of the WSOP Main Event for Bryn Kenney, who finished in 28th place. Gianni Direnzo (center, standing) had been struggling with a short stack for most of the day on Day 7 of the WSOP Main Event, until he moved all in with 8-6 suited after a flop of Q-6-3 (middle pair). Unfortunately, for Direnzo, Robert Pisano (foreground, right) had top pair, top kicker with A-Q suited. The last two cards missed Direnzo, and he was eliminated in 29th place. The field would continue playing until one more player was eliminated, and then stop for the night. 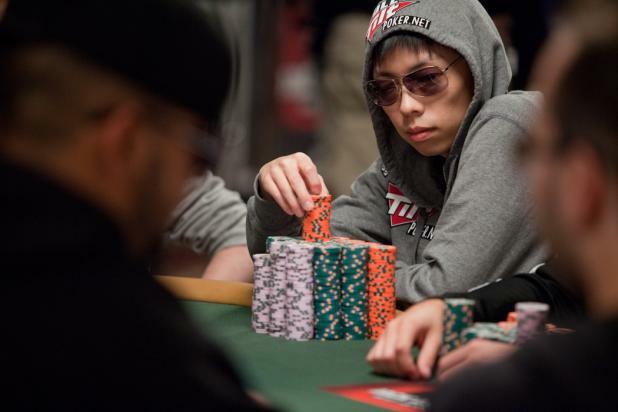 Joseph Cheong (24.5 million in chips) finished Day 7 of the WSOP Main Event as chipleader of the final 27 players, with slightly more than Cuong Nguyen (23.1 million). 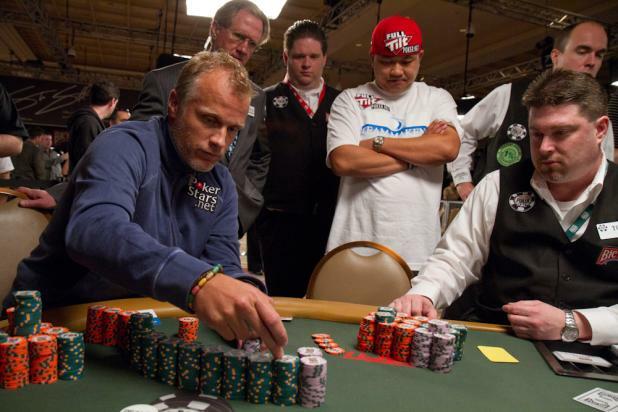 The two of them had a substantial lead over Pascal LeFrancois (in 3rd with 15.7 million) and the rest of the field. 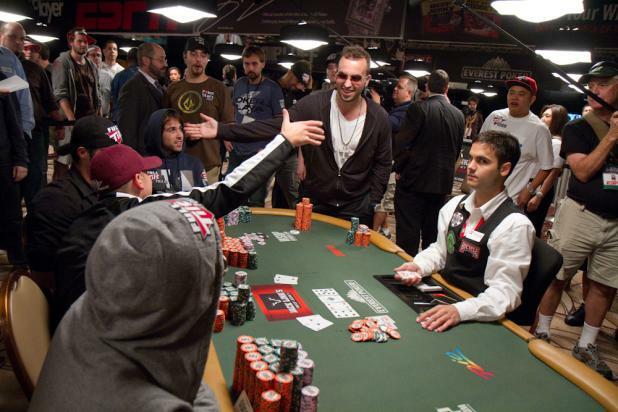 Michael "The Grinder" Mizrachi (left) had rebuilt his stack late on Day 7 of the WSOP Main Event. Here, he played a big pot against Matt Affleck (right) on a board of 7h-2c-2s-7c-Js. Both players checked the flop before Mizrachi three-bet the turn, and Mizrachi fired again on the river. Affleck called, showing 8s-7s for a full house, sevens full of deuces, and Mizrachi mucked. Affleck won the pot, and would finish the day sixth in chips, while Mizrachi finished the day in the middle of the pack. Gabe Costner (not pictured) was short-stacked but got his money in good with pocket tens (10-10) against Scott Clements (right), who had A-9. 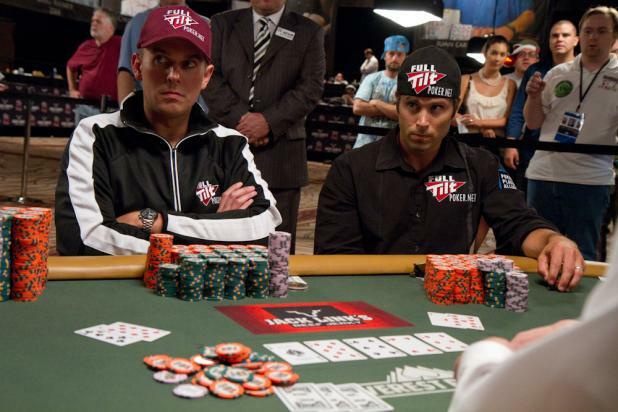 Clements paired his ace on the flop, and Costner never caught up. 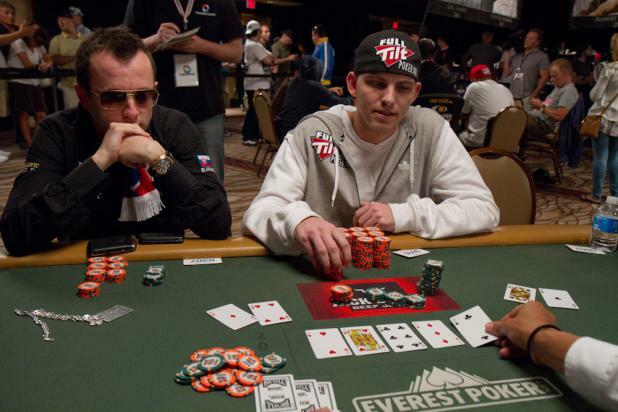 Benjamin Statz (left) quietly witnessed Costner's elimination in 35th place. 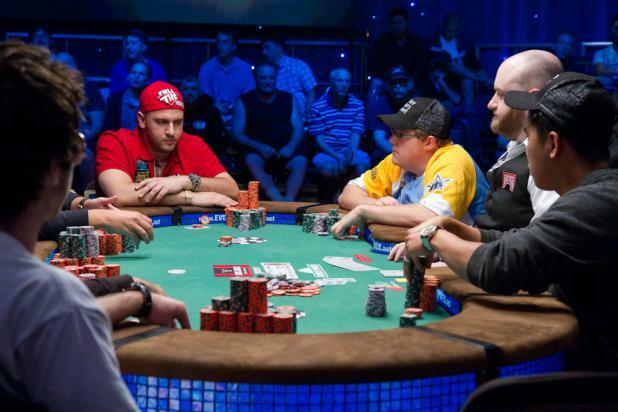 With four tables remaining on Day 7 of the WSOP Main Event, Bryn Kenney was one of the only players without any sponsor patches. It's a risk that some players take, because if they make it deeper, they're able to negotiate better sponsorship deals. But if they bust, they get nothing. Dag Palovic (left) moved all in preflop with A-4, and John Dolan (right) called with A-Q suited. Palovic never improved, and he was eliminated in 37th place. 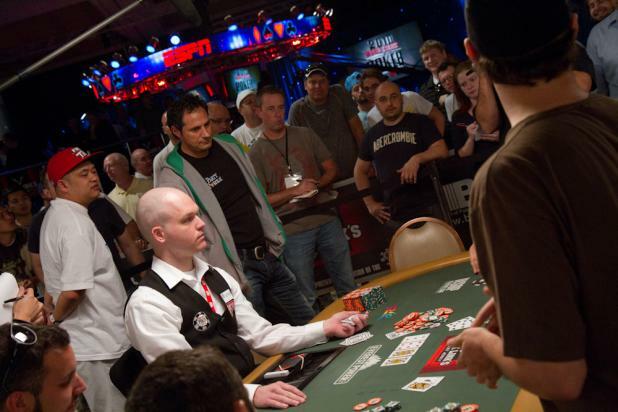 With 36 players remaining, the field was down to the final four tables. 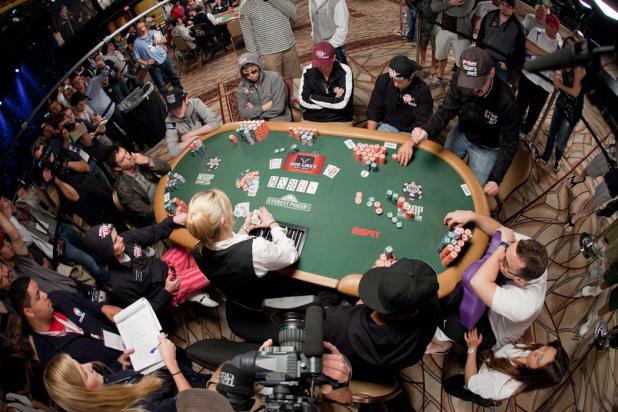 A top-down view of the table as a player wins an all-in situation to double his chip stack. 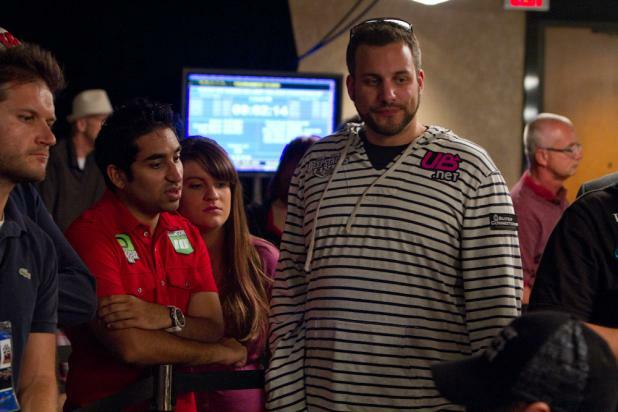 Adam "Roothlus" Levy (right) chats with Amit "Amak316" Makhija on the rail during Day 7 of the WSOP Main Event. 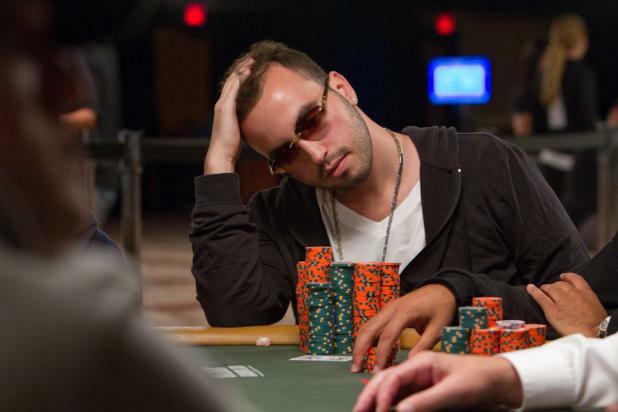 Levy made a deep run in the 2008 WSOP Main Event, finishing 48th, but he's already gone deeper than that this year. Levy is popular among other young players, and if he makes the November Nine, expect a rail heavy with young pros.